Dissonent Voices Greet Court's Immigration Hearing : It's All Politics At one spot, songs and chants in English and Spanish called on the court to strike down the law. 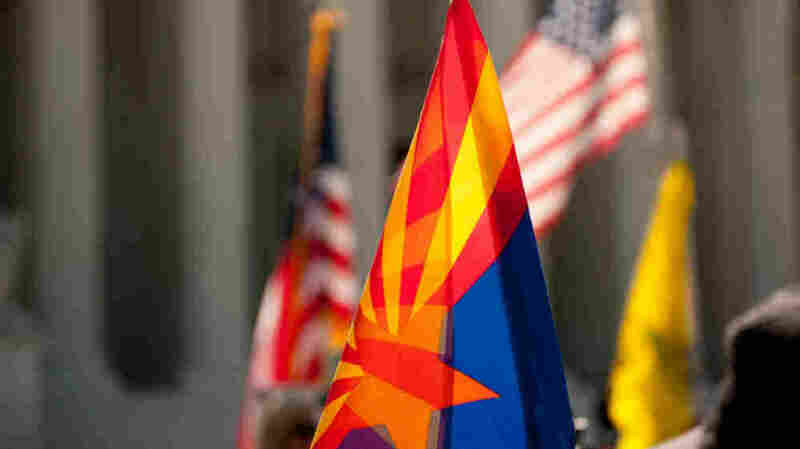 At another, supporters of State Bill 1070 unfurled flags of the United States, Arizona and the Tea Party. 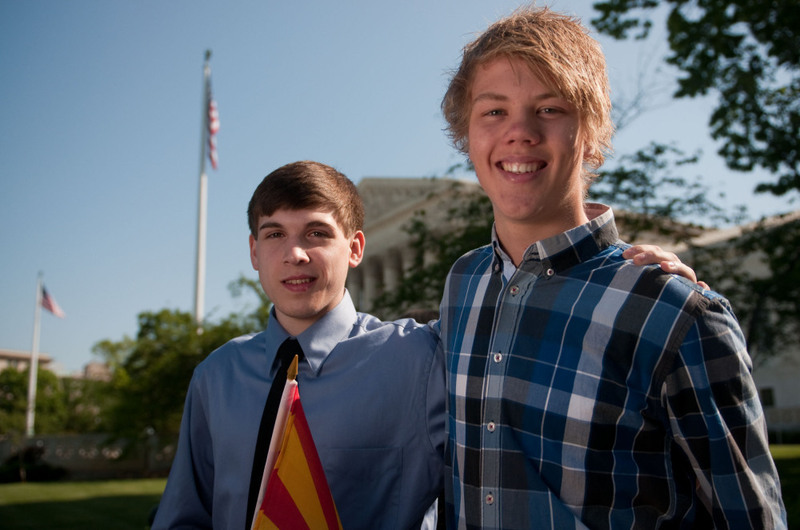 Here are a few of the people who traveled to the steps outside the court on Wednesday. Supporters of Arizona's immigration law fly the flags of the state (center), the United States and the Tea Party on the steps of the Supreme Court during oral arguments about the law on Wednesday. 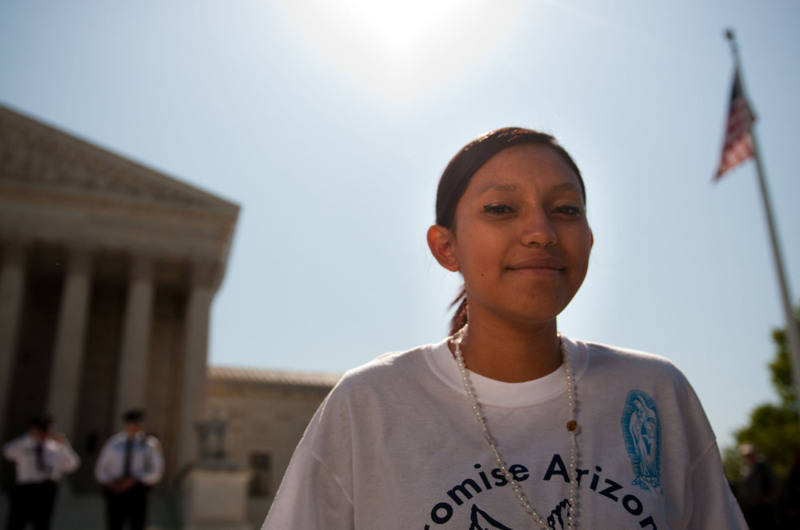 A chorus of voices rang out Wednesday on the steps of the Supreme Court building, where justices were hearing arguments about Arizona's controversial immigration law. But the demonstrators were singing from many different hymnals. 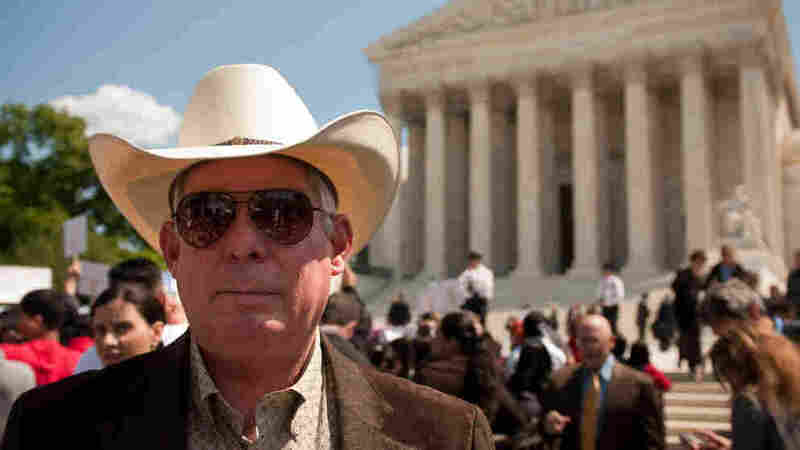 At one spot, songs and chants in English and Spanish called on the court to strike down the law. 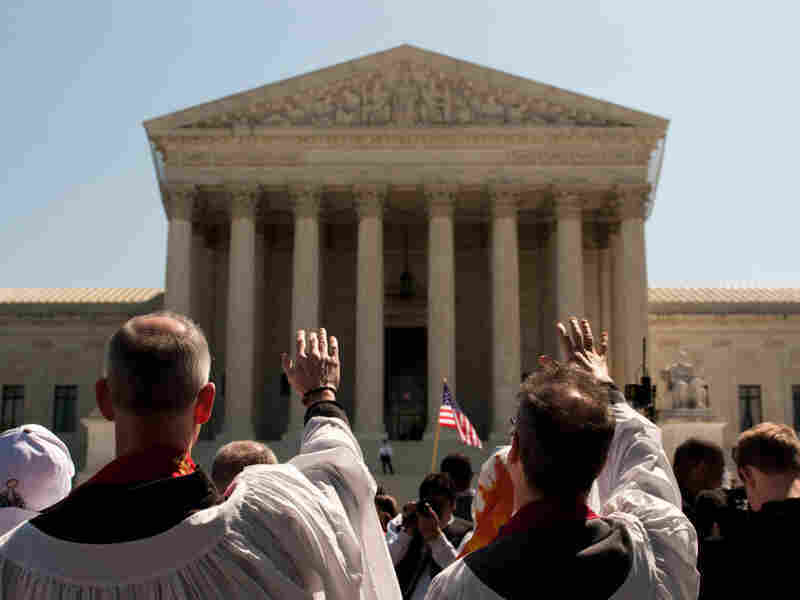 A group dressed in robes parades in silence around the Supreme Court building in a Bible-inspired "Jericho Walk." 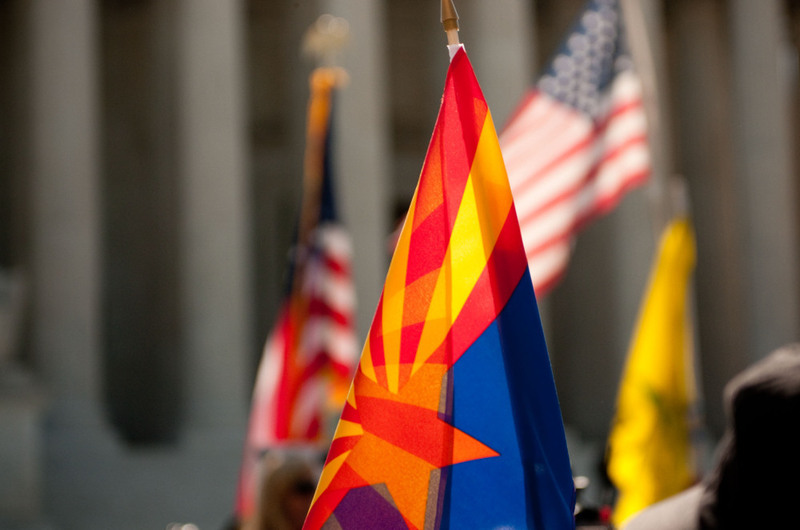 At another, supporters of State Bill 1070 unfurled flags of the United States, Arizona and the Tea Party. 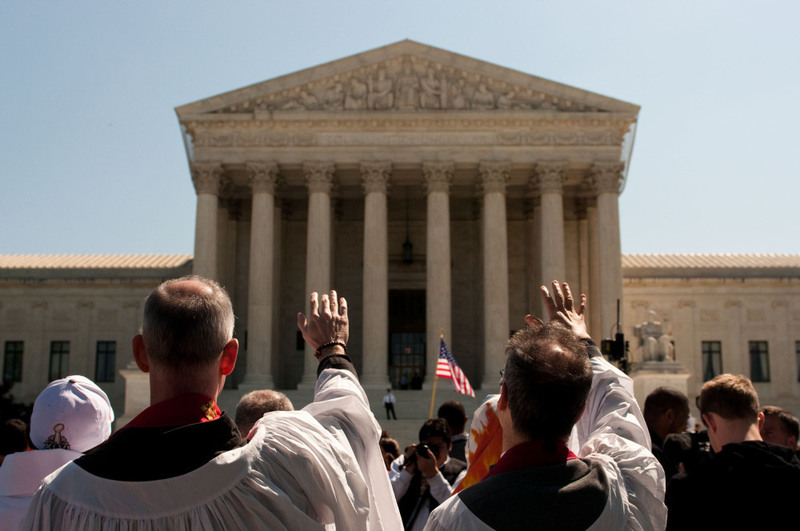 Later in the morning, as oral arguments began inside, clergy members opposed to the law circled the building in a self-titled "Jericho Walk," while others held up images of the Virgin of Guadalupe and Jesus. 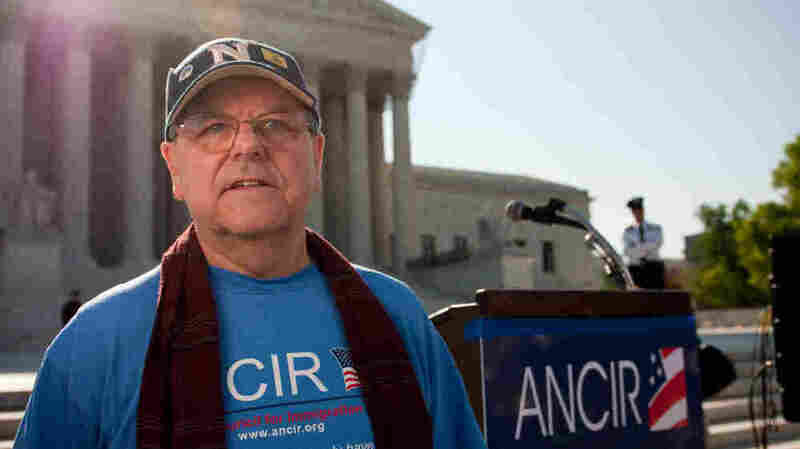 The law was intended to curb illegal immigration in a border state, and it has ignited a broader national discussion about federalism, legal and illegal immigration, discrimination and racial profiling. Pastor Warren H. Stewart of First Institutional Baptist Church in Phoenix joins other clergy members to demonstrate against SB 1070. 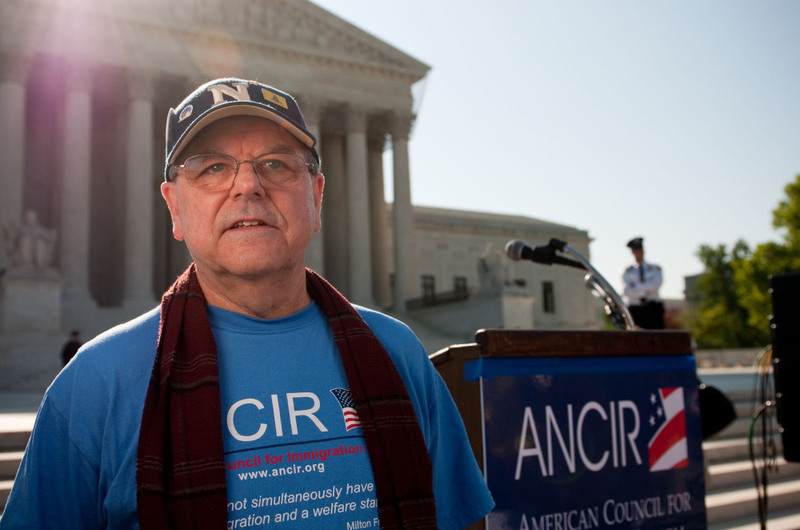 "I'm here because this is a justice issue ... This whole movement is like deja vu for the civil rights movement 50, 60 years ago. I mean, blacks used to be racially profiled and now Latinos are. ... 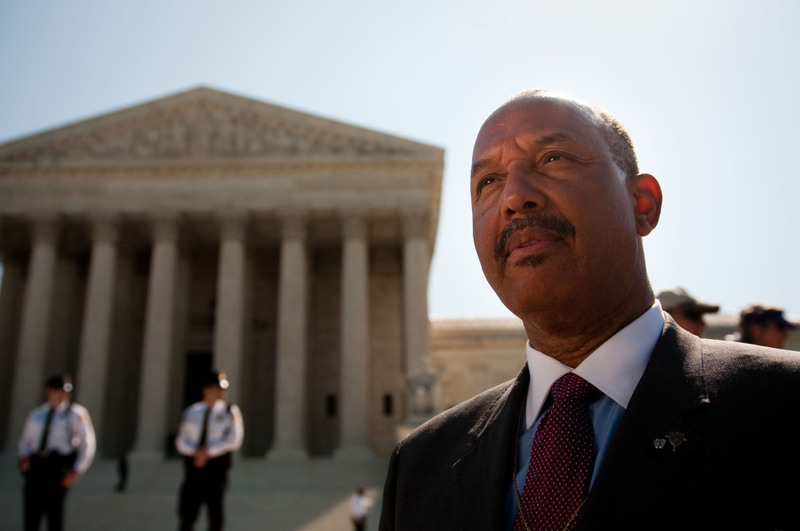 It has been my task to share with leaders in the African-American community and in the faith community that this is an issue because it is a biblical issue, an issue of biblical justice." Michael McLaughlin, vice president of the American Council for Immigration Reform, demonstrates in support of SB 1070. "A lot of this is being used as a political opportunism for people to create racial divisiveness, which to me is not what the American people are about. I think we're the most tolerant people on the face of the Earth when it comes to other races and other people. I've lived 25 years of my life overseas. I'm not against other cultures ... but I think that we have to assimilate immigrants when they come here, and that's my greatest fear that we're not assimilating them like we used to." 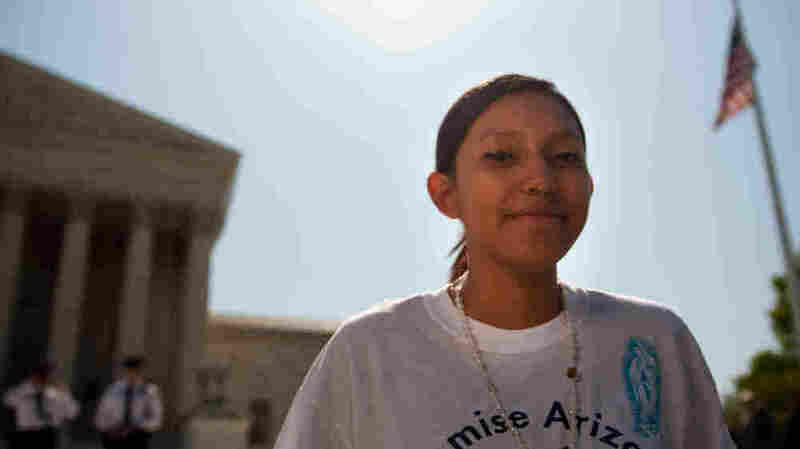 Rosa Cabezas traveled from Mesa, Ariz., to demonstrate against the law she says unfairly targeted her father. "SB 1070 has been racially profiling my family, my community and all the Latino community all over the country. 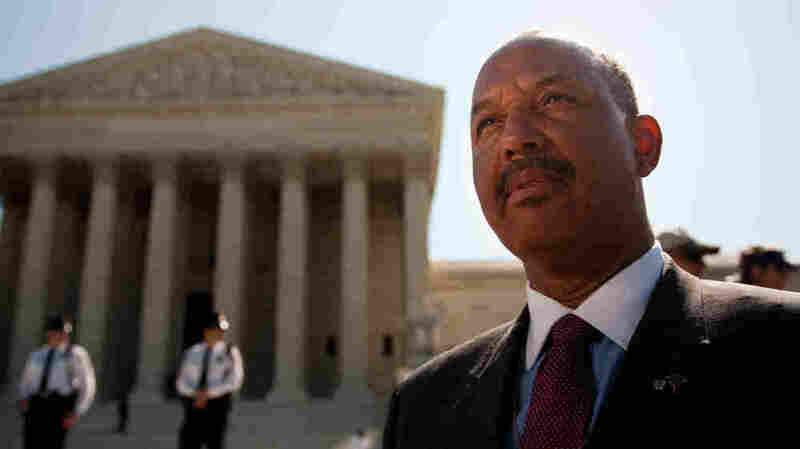 [My father] went to look for work in California, and at the state line he was detained, and he was racial-profiled, and he was being charged for drug smuggling, but they could never find real good evidence to say that ... He has a work permit. He has an Arizona driver's license." 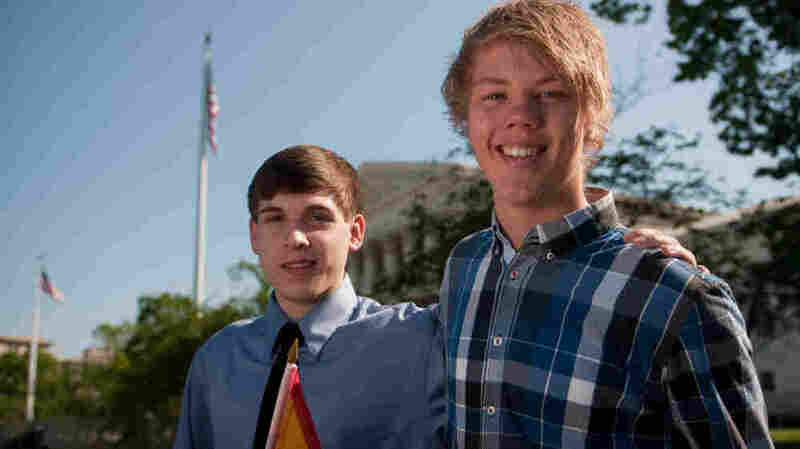 Benjamin Williams (right) and Ole Martin, classmates from Juneau, Alaska, disagree about SB 1070. "I feel that through the 10th Amendment, it supports Arizona, because it's the right of the state to make their own laws that are applicable to them, and it's not [up to] the federal government to dictate what they say or not. It's really [Arizona's] choice." "I don't think it's morally right. ... Since I'm from Norway and Europe, we have free travel all over Europe where we don't have to show passport for when you're crossing the borders, necessarily, so to me it seems kind of silly." 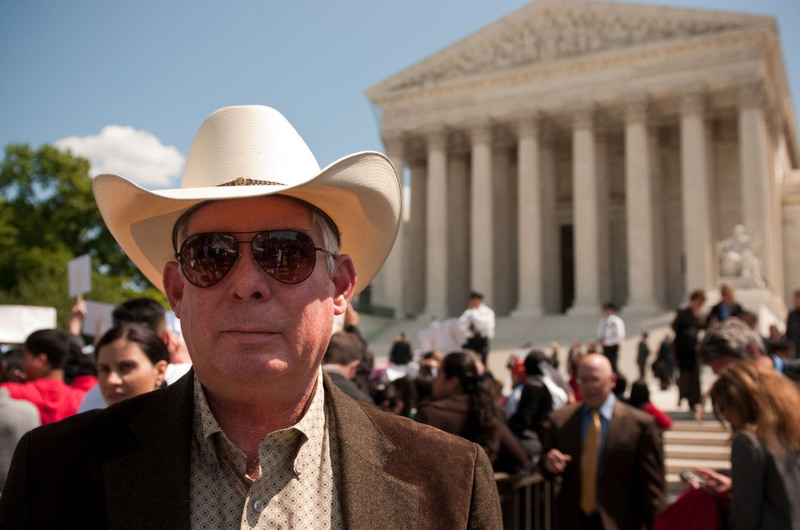 Sheriff Larry Dever of Cochise County, Ariz., attended the Supreme Court's oral arguments on Wednesday. "I absolutely support SB 1070. In fact, I'm the ... guy who started it all ... The judge's questions were excellent, pointed to both parties, and they extracted what we hoped they would hear in the long run. You can only guess what they're going to do, but I feel pretty confident we're going to come with at least a good portion of the law intact."